Secura Key's new NOVA.16 access control panel provides access control for up to 16 doors, using Smart Readers on an RS-485 network. Each Smart Reader has a solid-state Strike Relay, two Open Collector outputs, and four inputs. The Smart Reader only requires a twisted pair for data, plus an additional pair for DC power. The panel includes an Ethernet adapter. Each Reader includes all the inputs and outputs to control a single door or gate, eliminating multiple cable home runs back to the controller, providing a huge savings in installation labor and cost. System expansion also becomes simple and economical. Tired of trudging out in the rain or snow to check if the mail was delivered? The STI Wireless Mailbox Alert with Voice Receiver immediately lets you know when the mail has arrived, eliminating repeat trips out to an empty mailbox. 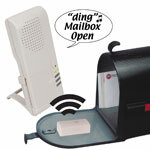 When the mail is delivered, the sensor sends a wireless radio signal to the included 4-Channel Voice Receiver. The programmable receiver identifies the mail has arrived (i.e. ding-dong, mailbox alert, mailbox open, etc.). Supervised for low battery and signal reception. The voice receiver offers ten tones/tunes and speaks 53 selectable words (English or Spanish). Free Speco Technologies training hosted by Graybar Canada April 23 Windsor, Ont. Tri-Ed Vancouver Kantech Access 101 Training April 28 Vancouver, B.C. ADI Expo April 29 Edmonton, Alta. Southwest Microwave: Perimeter Defense Seminar May 6 Toronto, Ont. Tri-Ed's Newfoundland Tech Tour May 8 St. John's, Nfld. Tri-Ed Toronto Customer Appreciation Event May 21 Toronto, Ont.